For all you mad hatters out there, with Christmas only a week away, why not prepare yourself to brave the freezing cold waters on Boxing Day and join in the fun raising money for charity by doing the Boxing Day Dip in Whitby or the Boxing Day Raft Race in Scarborough Harbour. The Raft Race at Scarborough is organised every year by the Sub Aqua Club in conjunction with the Fisherman and Fireman Charity fund since 1972. The day gets going with a comical charity football match on the beach to raise money for the Fisherman and Fireman charity. This is then followed by the raft race down in the harbour. 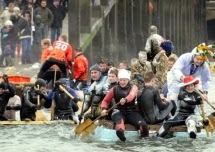 Even the crowds get involved in this by throwing eggs and flour at the rafts. All in all its a very entertaining day raising money for charity!! 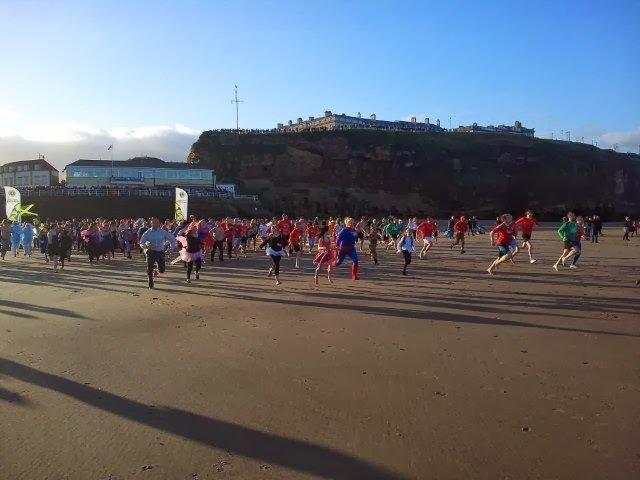 The Boxing Day Dip in Whitby is organised by the Whitby Lions Club. This is another great way of raising money for charity. You can either do it solely for the Whitby Lions Club, or you can raise money for another charity. They'll get 80% of the money you raised, with the other 20% going to the Whitby Lions Club. All you need to do is find an old fancy dress outfit which you no longer wear (and don't mind getting wet!) and head on down to the bandstand to register. Then its time to join all the other mad hatters in running into the freezing cold north sea!!! So if your stuck for something to do on Boxing Day why not head down to Scarborough Harbour or down to the beach in Whitby to watch all them mad hatters run into the North Sea on Boxing Day to raise money for Charity. Both events are worth going to watch, but if you do venture out make sure you wrap up warm! !